Send our Festive Favourite flower bouquet, complete with a hurricane glass enclosed taper candle. Flowers with candles are a holiday tradition. Light up the holiday table with this festive centerpiece. 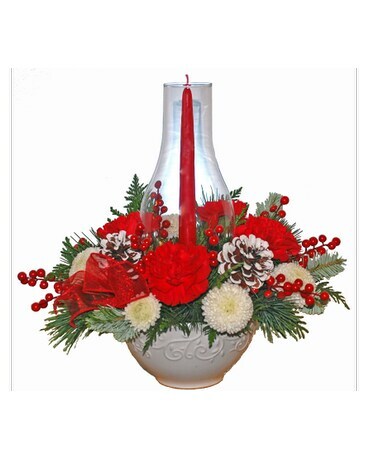 A white ceramic bowl just brimming with fragrant evergreens, red berries, frosted pine cones, sheer red ribbon, bright red carns, white mums a glass hurricane and red taper candle. Designed by Helen Blakey Flowers, Toronto ON. Approx size; 24 cm W X 33 cm H.
Available for delivery from our Toronto flower shop to Scarborough, North York, Markham, Toronto (all M postal codes) and the Greater Toronto Area. For delivery outside of the GTA, substitution of similar product will be neccessary.